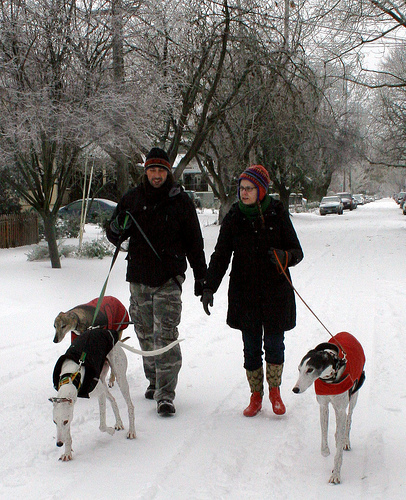 For a lot of people, the thought of a long walk on a cold winter's day can sound daunting. But as dog owners know, it's a daily necessity. If you're a new dog owner, the cold weather and shorter days shouldn't put you off going on long walks. You just need to remember to be prepared and keep some basic precautions in mind. Of course, where you live in the world determines the amount of daylight you get during the winter months, and it goes without saying that you should be aware of those hours in your area. If you're going on country walks make sure you always know where you're going on these shorter days and allow plenty of time to get back. It's these rural walks that need the most attention and you should always be familiar with the area. Snow and ice can obviously be a problem on winter walks. On icy roads care should be taken to make sure your dog is in control, especially on those roads without side walks. In icy an snowy conditions it's a good idea to use a shorter lead to give you more control over the walk. When there's snow on the ground take precautions in rural areas by sticking to paths (and again be familiar with the area) just in case you get out of your depth. Small dogs, especially, can easily get stuck in deep snow. A major problem during the winter months is frozen lakes and ponds. We all know it's a big mistake to risk walking on the ice, but dogs can be none the wiser. Again, this goes back to being familiar with the area; know where the bodies of water are and try to steer clear. Of course, this all depends on how comfortable you are with your dog and how obedient he or she is. On these winter walks the recall command is the most important, if you allow off-leash treading, so if you're a new dog owner, spend a lot of time on this command during the months before winter. Try to stick to well lit areas. Wear bright colors or a florescent, high-visibility jacket. Make sure you're carrying a charged cell phone. If possible,carry a pocket torch or flashlight. Finally, make sure YOU wrap up warm (a Dog with thin or little fur could also benefit from a coat) and enjoy the beautiful winter scenery. It really can be one of the most scenic times of the year so enjoy those walks. I think the most important point to remember is to be familiar with where you're walking. Lewis Waller is the co-founder of Dog Walkers City, an online directory of dog walkers and sitters that covers the US and the UK.